France topped Group C to advance to the World Cup last-16 after playing to the first goalless draw of the tournament against Denmark at the Luzhniki Stadium on Tuesday afternoon. Didier Deschamps, marking his 79th game in charge to level Raymond Domenech’s France record, rested key players such as Paul Pogba and Hugo Lloris and kept Kylian Mbappe on the bench for the majority of the game with an eye on their knockout campaign. Deschamps’ six changes contributed to a lack of cohesion that prevented France from ending the group stage with maximum points for the first time since they won the tournament in 1998, Antoine Griezmann struggling to link with partner Olivier Giroud. 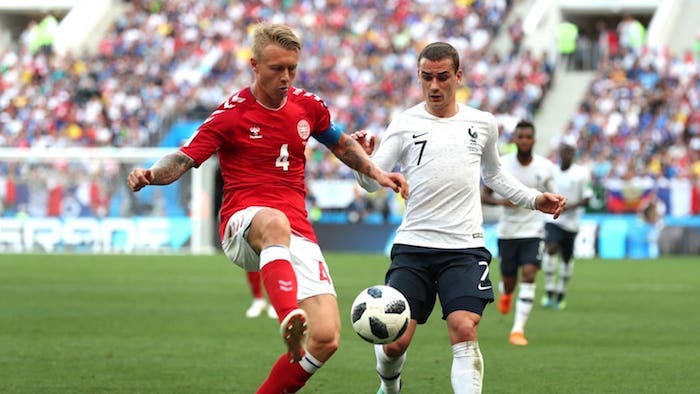 Denmark – likely to face Croatia next – rarely threatened and appeared happy with a 0-0 draw that sends them into the knockout stages for the first time since 2002, with Tottenham star Christian Eriksen providing their greatest threat in front of goal. Griezmann set up Giroud, but a late offside flag spared the blushes of the striker – scorer of Les Bleus’ last three goals against Denmark – after he blazed over the crossbar. Steve Mandanda became France’s oldest World Cup debutant and the goalkeeper almost cost his side, spilling a long-range Eriksen free-kick before recovering to claim the loose ball ahead of lurking striker Andreas Cornelius. Eriksen drilled wide in the 59th minute as Age Hareide’s side took control of the contest, although France substitute Nabil Fekir rippled the side-netting with an ambitious drive shortly after his introduction for lacklustre Griezmann.